Who says cookies are off limits when you’re dieting? These low-calorie Peanut Butter Cookies certainly aren’t! With just 3 Points per cookie, this Peanut Butter Cookie Recipe is sure to be a favorite of any Weight Watcher. They are so easy to make, and with just a few simple changes to the traditional peanut butter cookie recipe, more than half the calories were able to be eliminated, making it much lower in Points. So even though you are following the Weight Watchers Program, you can still treat yourself to a couple of these tasty peanut butter cookies and enjoy them, knowing that you are going over your Daily Points Allowance. So the next time you want a diet-friendly snack that the whole family can enjoy, give this Weight Watchers Cookie Recipe a try! A reliable, classic recipe that never fails. Easy to make, homemade peanut butter cookies that are sure to become a family favorite. Combine flour, baking soda and salt in a small bowl; mix well and set aside. Combine margarine and peanut butter in a mixing bowl; beat on medium speed until blended and smooth. Gradually add both sugars and beat until blended; add egg white and vanilla and beat until smooth. While beating on low speed, gradually add flour mixture and mix until just blended. Preheat oven to 350ºF. Coat 2 large baking sheets with cooking spray. Remove cookie dough from freezer and slice crosswise into about twenty-four 1/3-inch-thick slices; place slices 1 inch apart on prepared baking sheets. Bake until golden around edges, about 8 to 10 minutes. Transfer cookies to wire racks to cool completely. 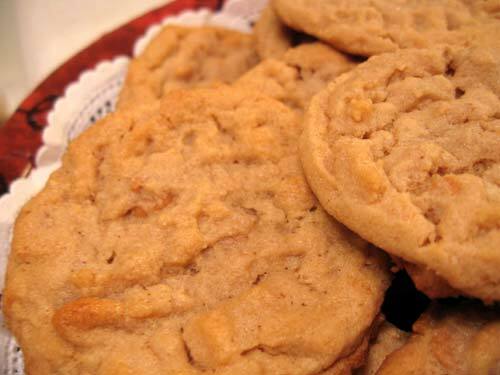 Flavor Booster: Browned margarine has a nutty flavor that enhances a peanut butter cookie. Melt the margarine in a small skillet until it sizzles and just begins to brown. Remove from heat and freeze for 20 minutes, or until firm, before using in the recipe. Smart points value is 2 points per cookie as written. can you substitute the butter for applesauce ? In case anyone else was curious, I entered this into the WW recipe builder using 3 Tbsp regular butter and 2 Tbsp regular JIF peanut butter and it works out to 2 WWP+ per serving if you make 18-24 cookies from the batch. Hope it helps! i calculated all the ingredients using the points plus scale and if the recipe makes 24 cookies, then it is 1 points plus per cookie. considering margarine is so incredibly bad for you is there something you can substitute that with? Using the recipe builder on Weight Watchers I added exactly what you have in the recipe and it calculated the points at 46 P+. I really really hope I did this wrong. Thanks for the recipe! Its 62 calories per cookie. Also, given these are frozen, it takes much longer to bake. Do you have the nutritional information in order to calculate the points plus values of this recipe? Or do you know the points plus value? I don’t, unfortunately. Looking back, I wish I would’ve saved it. I had no idea that WW would change their program. Naive of me, I know. One day, I will re-build this recipe and calculate it with the new data. No, that post still lists the old Points value. My family loves these cookies. They made it two days in the house. Remember, the salmonella outbreak could affect your pet as well. It's been found in dog biscuits and dog food, where the peanut butter comes from the same plant in Georgia.